Connect the pet to an iPod or computer and watch as it dances along to the beats. "Mi Pet" is technology at its best. 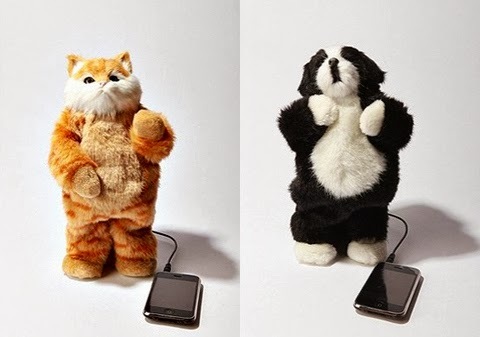 Imagine connecting your MP3 player to a plush animal and watching it come alive. Well it's here and it's wonderful. The ideal gift for any occassion and any age. Simply connect your MP3 Player to the cable provided and watch this golden retriever come alive. Music plays through the built in speaker and the golden retriever dances to the music right before your very eyes. What a wonderful way to enjoy your favorite music. With adjustable arms you can position your pet to dance disco, rock, country, classical, latin, rap and more. Each measures 11"H, includes connection cable, dance on/off button and requires 3AA batteries (not included). For ages 8 and up. Other pets include Border Collie, Orange Tabby and Black and White Kitten also sold Amazon.